Serving several different functions, the Handyman lives up to its name. It serves as a favorite switch for Strymon products, a fixed or simple style expression switch, a dual preset switch for the Line 6 DL4, and even an amp channel selector for various amps. As an expression it works with both TS and TRS type expression connections (but will require a TRS cable to work properly). It'll switch preset channels on the Line 6 DL4, as well as all the other Line 6 series pedals like the DL4. It can also connect to an EHX Memory Boy and will switch from the most minimum expression setting to whatever setting you dial in on the pedal (ex: Feedback knob on the Memory Boy Deluxe from 0-40% or 0-100%). Finally, it can also work as a channel amp switcher. It doesn't need a 9V power adapter because it draws power for the LED from the device it's connected to by the TRS connection. 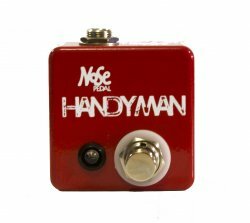 No matter how many times you change out pedals and change around your rig, you can always find a use for the Handyman.